Quality CPR in the palm of your hand. Exclusive QCPR technology provides real-time coaching, post-event Quick Review, and summary feedback to trained rescuers. 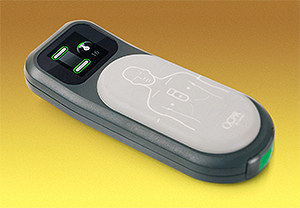 Helps to insure quality CPR and improved patient outcomes from cardiac arrest. CPRmeter is also advantageous in the training environment to help learners improve and maintain CPR skills, while enabling instructors to utilize QCPR Review software to assess and document trainees' competency.